Great looking 9 Iron that would be ideal for practice or to make up a set of clubs, suitable for most players. 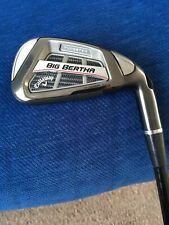 Callaway Big Bertha Irons RCH 96. 3 Iron - Sand Wedge (9 clubs) Very good used condition. Great set of clubs in their day. Ideal as a start out set for beginners. Very forgiving clubs which still perform very well. 3 Iron - PW have Callaway Firm Flex graphite shafts with Medallist grips (all in excellent condition) SW has Callaway Regular Flex graphite shaft and Golf Pride grip in good condition. Some scuff marks on shafts through general wear and on bounce of SW (see pic). New listingOriginal Callaway Big Bertha #9 Iron. Original Callaway Big Bertha #9 Iron. Fitted with regular graphite shaft. Brand new grip. Very good condition. New listingOriginal Callaway Big Bertha #5 Iron. Original Callaway Big Bertha #5 Iron. Fitted with regular graphite shaft. Brand new grip. Very good condition. New listingCallaway Big Bertha 7 iron & Mamiya Recoil "F3" Regular Flex Graphite Shaft. GOLF 6 IRON, CALLAWAY BIG BERTHA, RIGHT HAND, 37.5" LONG, REGULAR FLEX GRAPHITE SHAFT, LAMKIN GRIP, USED. Callaway 6 iron ideal practice club or to make up a set, suitable for most players. A good club to have on the course, having a clear out, reasonably priced. GOLF 6 IRON, CALLAWAY BIG BERTHA, RIGHT HAND, FIRM FLEX GRAPHITE SHAFT, BIG BERTHA GRIP, IDEAL PRACTICE CLUB. Great looking 6 Iron that would be ideal for practice or to make up a set of clubs, suitable for most players with a fast swing. Shaft: aldila synergy 60ir. Model: rogue demo 7 iron. Shaft Material: graphite. Flex: regular. Grip: lamkin z5 standard. We specialise in the sale of affordable new golf balls and lake golf balls. Other deals available include a wide range of clearance apparel, footwear and accessories. CALLAWAY GOLF X20 6 IRON, RIGHT HAND, REGULAR FLEX GRAPHITE 75g SHAFT, CALLAWAY GRIP, 37.5" LONG, VGC. Great looking 6 Iron that would be ideal for practice or to make up a set of clubs, suitable for most players. Callaway X Hot Pro 6 Iron, stiff graphite shaft. 2fl. Project X pxi 6.0 shaft Ex demo Fantastic club. Used but is superb condition. Very little used. Standard loft, lie and length. Head 9 (only very minor cosmetic) Shaft 9 Grip 9 Thin top line, more intermediate level. Any question please message. Happy bidding. Dispatched with eBay delivery – Shutl 2-3 days. Callaway Ladies Razr X Black Irons - Used. 5, 6, 7, 8, 9, PW and SW. Please see photos. Although these irons are used, grips on all items are in good condition. Also selling Callaway X2 Hot Driver, 5 wood and 7 wood separately listed. Any questions please ask.Payment within 48 hours please. Also note: They will NOT be sent by Ebay shuttle. Callaway Edge 7 Iron Reg. Condition is Used. But only shows only very sutble signs of being hit, otherwise in fantastic condition. Standard loft, lie and length. Grip. 9.5 Shaft 9.5 Head 9 Game improvement iron, slightly thicker top line. Any question send me a message. Happy bidding Dispatched with eBay delivery – Shutl 2-3 days. Graphite shafts in very good condition. One scratch on each shaft. Condition is Used. Excellent condition. Shaft: rch 96 series. Model: big bertha X12 iron. Grip: callaway. Flex: regular. We specialise in the sale of affordable new golf balls and lake golf balls. Other deals available include a wide range of clearance apparel, footwear and accessories. Shaft: big bertha gems 65i. Model: big bertha gems 7 iron. Grip: callaway. We specialise in the sale of affordable new golf balls and lake golf balls. Other deals available include a wide range of clearance apparel, footwear and accessories. Shaft: big bertha gems 65i. Model: big bertha gems 5 iron. Grip: callaway. We specialise in the sale of affordable new golf balls and lake golf balls. Other deals available include a wide range of clearance apparel, footwear and accessories. THIS IS A REALLY GOOD EXAMPLE OF THIS VERY POPULAR IRON ,GOOD ADDITION TO ANY BAG OF CLUBS . GRIP: CALLAWAY LADIES. MATERIAL: GRAPHITE. IRON: #6 IRON. SHAFT:X HOT 50g. LENGTH: STANDARD LADIES. MODEL:X HOT. Callaway X Forged 21° CF18 UT iron. Project X 6.0 precision shaft - Stiff flex. Golf Pride New Decade grip. Condition is Used. Heads are in great condition with only minor signs of use. Callaway Fusion Wide Sole 3 Iron. Callaway SteelHead X16. Lincs Golf. A DECENT USED CLUB. LIGHT WEAR to FACE and SOLE. Callaway XR OS 6 iron. Ladies Callaway Solaire. Lincs Golf. Callaway Golf X Hot 7 Iron. Please note the bag rub mark on the shaft (as shown), otherwise the club is in very good overall condition. Callaway X Hot 75 gram regular flex steel shaft. Black/Blue Sharpro Dual Compound grip in usable condition. All pictures are of the actual club for sale. Callaway Golf Big Bertha 9 Iron in good used condition. Callaway Golf Big Bertha IV 60•65 Series regular flex graphite shaft. Callaway Steelhead grip is in poor condition and the club would benefit from a change. All pictures are of the actual club for sale.